Runic Games ends the year in style. And with lots of money. 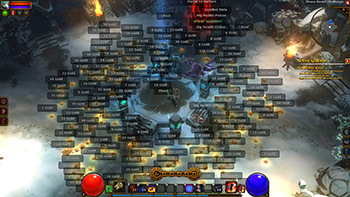 While Diablo III may have dominated the dungeon-crawling, loot-hunting genre in 2012 with its record-setting sales, that hasn't stopped its estranged, half-sibling, Torchlight II from breaking a few records of its own. "We had an amazing 2012, and proud to say that #Torchlight2 has sold over 1 million units! Thank you! Happy New Year's Eve everyone :)"
That's a million copies in just three months, not half-bad for a self-published, digital-only game from a tiny studio. The success seems well deserved. Torchlight II is currently sitting pretty at a respectable 88 out of a 100 on Metacritic. Oddly, even the notoriously bipolar Metacritic userbase seems to agree; The game's user review score stands at 8.8. Our own Mike Kayatta pegged it a little higher, giving it a tasty 4.5/5. The fact Torchlight II is going for just $20 probably didn't hurt sales either. If that's still a bit too rich for your blood, it's currently on sale on Steam for $9.99.